Actually, it's slightly less than 12 months if the rumours of an expanded festival (in both capacity by 20k and length by a day as it's the 40th anniversary) are to be believed. This year's event was one of the safest ever, and next year's is being planned to be even safer according to this article. So another year is over, tickets will probably follow the same pattern as last year, but we're not going to get confirmation of that for a wee while yet. I'll imagine that next year's will also sell out, even though the festival seems to have hit it's upper limit and the fact we are in a recession and times are bad for many of us. So be prepared for registration opening in August/September and tickets on sale in October. So, lets look forward to June 2010. Glastonbury 2009 is widely covered on the BBC's and Guardian sites for those of you returning who want to see what you may have missed. Posts: 524 start saving you munter!!!!!!! Posts: 1434 It's all in hand! Posts: 1434 It's in the cat! Posts: 1434 Me am going too. 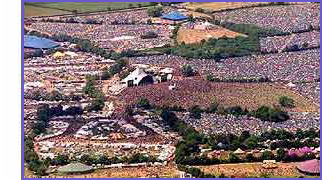 It's going to be my 16th Glastonbury!